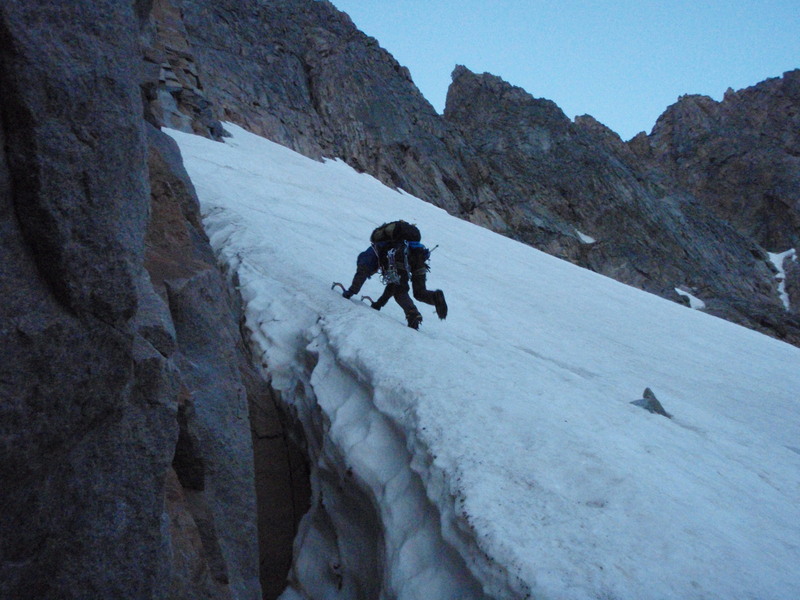 We traversed the sweeping snowfield below the east ridge, moving together and unroped across the thirty degree slope. The ice crunched beneath our crampons like broken glass and glittered in the twin pools of light produced from our headlamps. We didn’t talk much; the occasional attempts at speech were thwarted by the gusting wind. Loren traversing the initial snow slopes to the start of the climb. 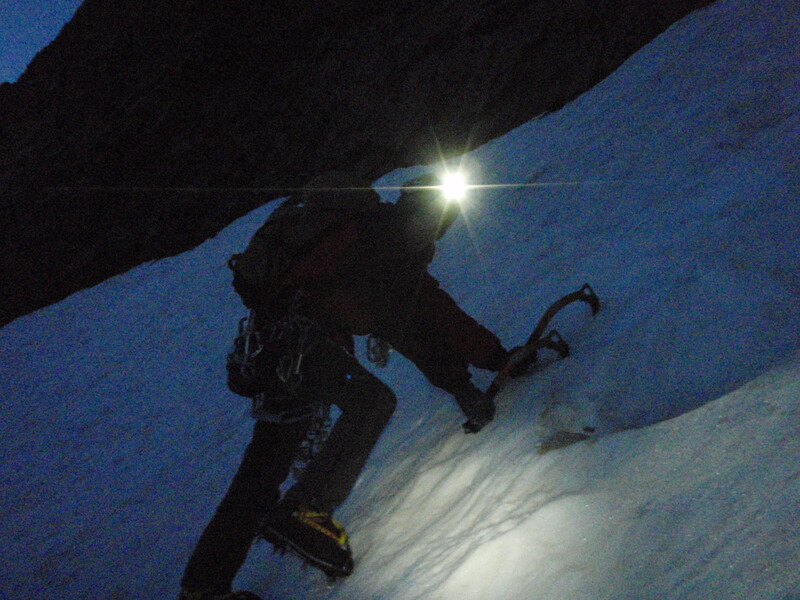 Loren stopped a few meters ahead, the light from his helmet searching up the steepening slope above us. I plodded the last steps to his side and swung my head up to add my light to his. “Not going to happen,” I called over my shoulder as I turned into the slope and started front-pointing up the fifty degree ice. 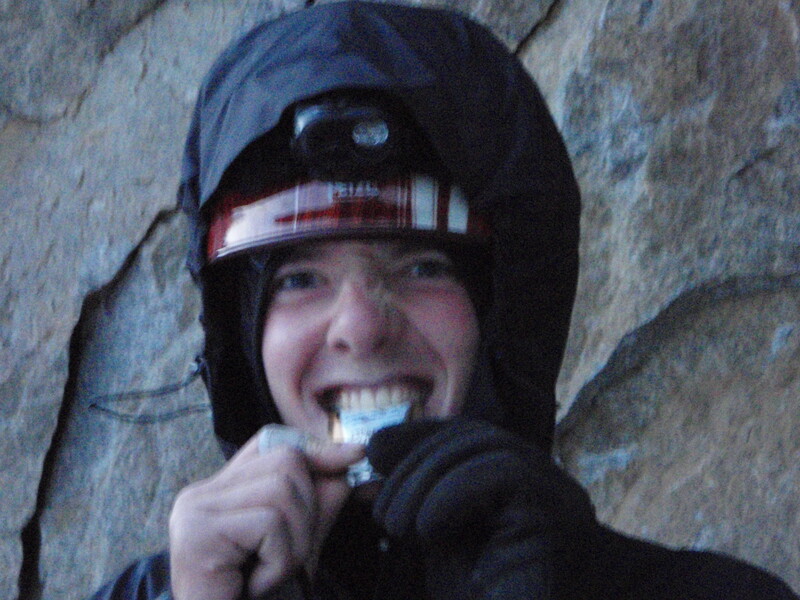 A huge smile spread across my wind-chapped lips – we were really doing this. My calves were on fire. 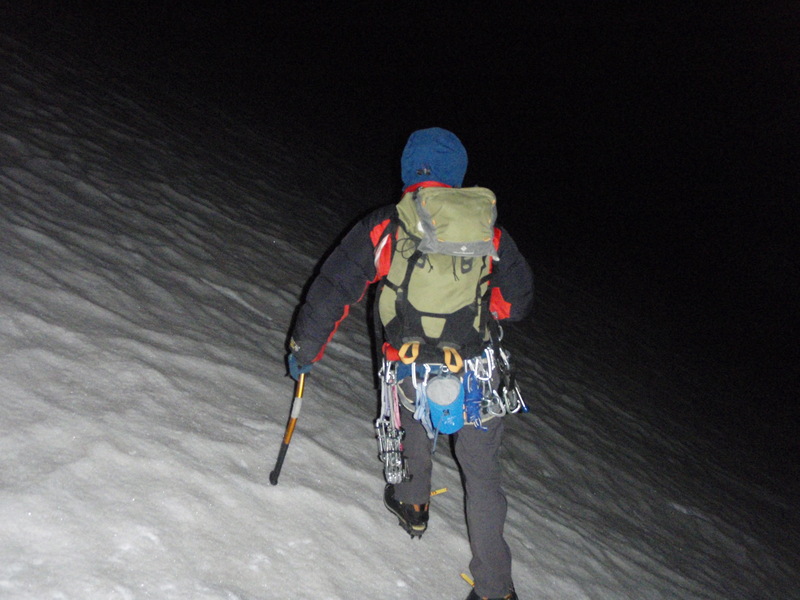 I hadn’t been in crampons for five months, and three hundred meters of low angle front-pointing had taken their toll on my legs. One hundred meters of beautiful, rock-hard ice remained before the rock climbing began, but I had to take a break before my legs could continue. Loren had stopped to wait for me in a small bowl just a few meters above me. 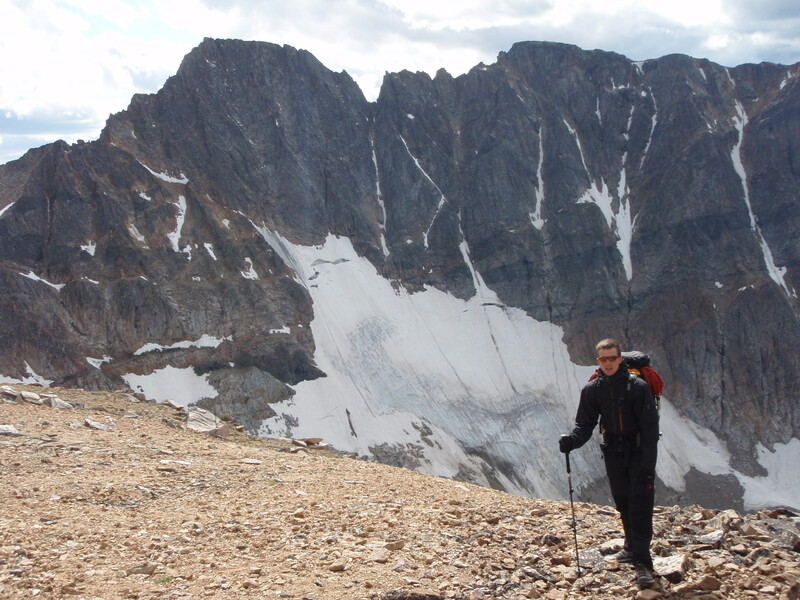 I climbed into the depression and collapsed, grateful for a chance to rest. 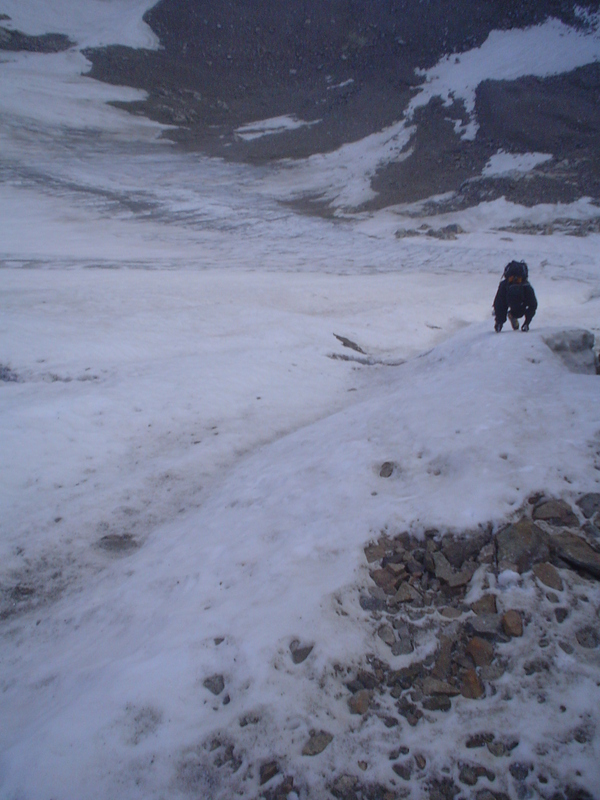 Making my way up the steepening glacier as the first grey light of dawn sweeps over the mountain. I swung my pack off my back and sat back down against the rock. The energy gel from my chest pocket, warmed from my exertion, squirted easily into my mouth. I washed it down with a swig of frigid water, swishing it around in my mouth for a second before letting it trickle down my throat. The words fell out of Loren’s mouth seemingly without conscious thought, and we just stared at each other for a second before descending into a gale of laughter. “That sounds painful,” I managed to say before another wave of laughter overtook me. He snapped the shot and handed my camera back to me. “Alright, Bambi,” he said, “it’s business time.” He yanked his ice tools out of the glacier and started moving smoothly and rapidly up the slope toward the gaping maw of the bergschrund. I took the time to take one more picture of Loren climbing above me before stowing the camera carefully in the thigh pocket of my climbing pants. Loren working his way up the final 100 meters of ice.